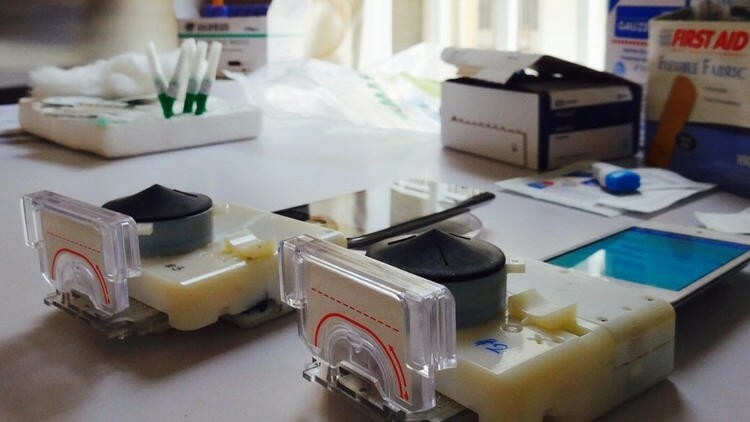 Researchers at Columbia University have created a smartphone accessory capable of testing for HIV and syphilis. The device is hardly any bigger than your typical phone, is inexpensive to manufacture and can produce results in a fraction of the time such testing normally takes. The smartphone accessory was recently put to the test in a small clinical trial in Kigali, Rwanda. Over the course of two weeks, 96 patients from three different health clinics trialed the unit which simply required patients to prick their finger to produce a small (one microliter) drop of blood. Researchers said the device performed about as well as commercially available tools already out in the field in terms of accuracy. The key difference is in price and time involved. Traditional lab equipment used to test for HIV and syphilis costs over $18,000 while the actual tests cost patients about $8.50 combined. The new smartphone dongle can be made for just $34 and takes only 15 minutes to process results. Existing lab hardware can take as long as two and a half hours to spit out its findings. What’s more, the device is incredibly energy efficient as it draws power from its host device. In testing with an iPod, researchers were able to conduct 41 tests before the music player needed to be recharged. The accessory is seen as a medical breakthrough, especially in Africa and other parts of the developing world where AIDS is a major problem.